Keto supplements have hit the market in a big way and people are seeing great benefits using these products. Ketosis is a powerful physiological state where the body’s metabolism is fueling itself off of fatty acids or ketone bodies. This article will cover how specific keto supplements can help improve ketosis and supplement a healthy lifestyle for optimal fat-burning. A ketogenic diet is a low-carb, high-fat diet that lowers the hormone insulin and teaches the body to use fat as fuel. After an initial adaptation process, the body gets good at using fat and converting it into an easily usable energy source called ketones. This is called fat or keto-adapted. This nutrition plan has been shown to improve insulin sensitivity and reduce inflammation. The result is a reduced risk of chronic disease as well as improved fat burning and lean body tissue development (1, 2). In addition, ketosis has been shown to improve brain and neurological health and have anti-aging benefits. The many benefits of ketosis seem to be largely derived from lowered inflammation and improved intracellular hydration levels. I am a huge fan of using food and lifestyle first to accomplish your health goals. However, there are some fantastic keto supplements that can provide a lot of support for individuals pursuing a ketogenic lifestyle. Some of you may choose to use keto supplements right away as you look to improve your health while others are interested in seeing how they fair without them. Both approaches can be beneficial. 80-90% of your health improvements will be made by improving your nutrition and lifestyle. Supplements can support your body in getting that last 10-20% which is vital for the very challenging and stubborn health problems. 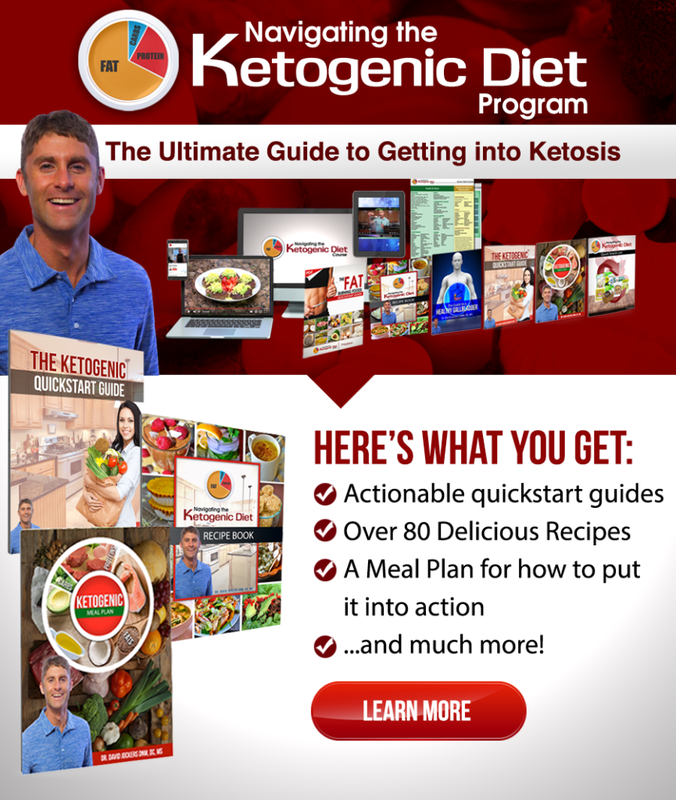 If you have no major complaints and are just looking to optimize your health, the nutrition and lifestyle strategies discussed throughout my website and in this ketosis article will most likely be all you need. However, if you are struggling with chronic health issues, keto supplements may be extraordinarily helpful. As a general rule, the longer your body has been suffering from chronic health problems, the greater the chance you will see very noticeable improvements through implementing lifestyle change as well as using strategic keto supplements. As always, be sure to discuss the use of supplements and dosages with your doctor. These are not meant to treat or cure any disease process but instead to supplement and support a healthy lifestyle. MCT oil or medium chain triglycerides (MCT’s) are unique fatty acids that are found naturally in coconut and palm oils. They have a remarkable ability to stabilize blood sugar and enhance ketone body production. They require very little digestive processing and provide almost immediate energy. This process makes MCT’s powerful for reducing inflammation, improving metabolism and enhancing cognitive function. They take a fundamental role on the keto supplements list because of these benefits. Most of these MCTs are easily digested and do not require the production and utilization of bile. The only exception is the 12-carbon chain lauric acid, which does depend upon bile and enzymes to be metabolized. Most fatty acids depend upon bile salt emulsification in order to be metabolized and absorbed. The production of bile is an energy-dependent process that takes place in the liver. The body stores extra bile in the gallbladder to use for high-fat meals. Individuals with a sluggish liver and gallbladder struggle to produce adequate bile. Other individuals who struggle with malnutrition or malabsorption syndromes will also struggle with fat digestion. These individuals can easily absorb and utilize these MCTs, however (3). This includes people with pancreatitis, cystic fibrosis & Crohn’s disease among others. These individuals would benefits greatly by adding MCT oil or powder to their keto supplements list. MCTs have a slightly lower caloric effect than typical long-chain fatty acids (LCFA). LCFAs have 9 calories per gram while MCTs have 8.3 calories per gram (4). MCT oil and MCT oil powder can be found at most health food stores and purchased online. It is one of the most commercially available keto supplements. Be sure to look at what MCT forms are in the particular brand you are looking at. I would not recommend getting anything with C12 – lauric acid, as it can easily be attained in a high quantity by consuming coconut oil. It is best to look for 2 different types of MCT products to add to your keto supplements. C8 and C10 MCT: This is a great MCT oil combination to use and it will elevate ketones and give you the benefits of MCT fats. It is typically more expensive than coconut oil but close to half the price that a C8 only MCT oil would be. C8 MCT: This MCT provides the fastest rise in ketones with the least metabolic burden on the body. You can purchase this with C10 or alone. Purchasing a C8 only MCT will cost significantly more than purchasing an MCT that is a combination of C8 and C10. A third approach is to purchase products that have a number of other ingredients such as protein powders that also contain MCT fats. This can be another great way to get the benefits of MCT, although you may not be able to know how much MCT is in each serving and what MCT forms are being used. I enjoy using our Keto Bone Broth Protein most days as a way to get high quality collagen protein as well as MCT’s and immune supportive herbs into my body. This comes in a chocolate, maple and vanilla. I recommend starting small and gradually building up. For some individuals, taking too much MCT too quickly can cause nausea, sore throat, vomiting and diarrhea. I recommend beginning with just 1 tsp daily and see how you are tolerating that over the course of a week. Some people tolerate MCT powders much better than the oils as well. With powders be wary of additional ingredients. A simple combination of MCT oil and acacia fiber is a good option. If you have no unwanted symptoms then you can increase your dosage by ½ tsp every 2-3 days until you get to your desired dosage (I think 3-6 tsp daily is great if you can tolerate it). At any point, if you notice an increase in symptoms I listed, then take it out for a day and drop your dosage by ½ tsp and see if that is the right dosage to use. If you know yourself to be a particularly sensitive individual, then I recommend starting with ½ tsp and working up if you are tolerating it ok. Some individuals have found that certain (very cheap) brands are more reactive, whereas the higher priced brands tend to be much more tolerable and effective. Just like anything…there are no short-cuts and you get what you pay for. MCT oil can be used in various drinks such as coffee, herbal teas, green juices, and smoothies. Additionally, it can also be used as a salad dressing or added to meat and vegetable dishes. MCT oil powder is great to have in smoothies or in fat bomb style recipes. Just remember, it is always safe to start with a low dosage and gradually work your way up as you see your tolerance level. Because of the versatility and direct ketone-boosting properties of MCT oil, I recommend it as one of the number one keto supplements to consider. Click the pictures below to see how to make two of my favorite keto recipes involving MCT oil! Short Chain Triglyceride (SCT) oil has similar benefits to MCT oil. Whereas MCT’s are 6-12 carbon length fats, SCT’s are between 2 and 5 carbon chain fatty acids. The most common and well-studied of these SCT fats is the 4-carbon chain butyrate or butyric acid. Butyrate is found primarily in butter or the clarified form of butter called ghee. This short-chained fatty acid is also naturally occurring in the human body. As we pass prebiotic fiber through the digestive tract, our gut bacteria use this fiber as fuel, producing butyrate as a byproduct. Getting additional amounts of butyrate from butter or SCT has many health benefits and is a great addition to your keto supplements. These benefits make butyrate an important consideration for anyone battling inflammatory bowel conditions, intestinal cancers, neurological disorders, and metabolic disorders (diabetes, obesity, etc.). Additionally, SCT oil contains fat-soluble nutrients such as Vitamin A retinol, Vitamin D, E, and K2. It is also a rich source of choline which is a key nutrient for neurological tissue and bile production. Because it is concentrated into short chain fatty acids, it also is easy on the liver and gallbladder and does not depend upon bile for digestion. Both MCT and SCT fats are highly ketogenic and do not depend upon liver, bile and pancreatic enzymes to be metabolized. This makes them both great keto supplements and excellent foods in general. The main differences between MCT and SCT oil are that MCT oil is derived from coconut or palm oil and comes in either an oil or powder form. SCT oil is derived from grass-fed butter and comes in a butter/ghee like consistency. SCT oil contains fat-soluble vitamins and other helpful compounds, while MCT oil is purified to only contain the fatty acids themselves. This oil is easier on the digestive system and tends not to have the same impact as MCT in terms of causing nausea, vomiting, gut pain or diarrhea for certain individuals. SCT oil is made from dairy but it is clarified to be completely free of whey, casein, and lactose which are the components of dairy that cause sensitivities and allergies. SCT oil can be used in all of the same ways you would use butter or ghee. So that would be in coffee or tea, on some keto bread or melted on meat and vegetables. I recommend beginning with a tsp daily and seeing how your body tolerates it. If you are doing well with it, then I would work your way up to 3-6 tsp daily. Exogenous ketones are a dietary supplement that can be consumed and transported directly to the cells for energy. Typically, the body would need to digest fats, transport them to the liver, convert them into ketones, and then be transported to the cells for energy. Exogenous ketones cut down this process and provide direct fuel upon consumption – perfect to add to your keto supplements. Exogenous ketones take MCT oils a step further. When you eat fats or MCT oil, there is a conversion process that must take place before ketones are actually produced, this means it is somewhat metabolically demanding on the body to make ketones. For people who have poor liver or gallbladder function, have poor mitochondrial health, or have never tried a ketogenic diet; the process of producing ketones can be stressful. In these cases, exogenous ketones can be powerful keto supplements. Exogenous ketones are a supplement that can be used to supply the body with a source of ketones that require almost no processing by the digestive tract and liver. This makes them great not only for helping someone get into ketosis but also as a quick energy source and performance enhancer for brain and body. Exogenous ketones are an immediate source of energy and therefore can be used for times when you need to be in high-performance mode, whether it be mentally or physically. They can be used before workouts or even before work to boost cognitive function and keep your brain functioning at its peak. Additionally, ketones have a protein sparing effect. What this means is that when ketones are circulating in the bloodstream, protein is used more efficiently. Many high-performance athletes are now using exogenous ketones to support the ability to work out strenuously and recover more effectively. Exogenous ketones are a combination of the BHB ketone with a salt in the form of magnesium, potassium, sodium and/or calcium. All of these salts are electrolytes and have great benefit on the body. I recommend trying to find ketones that use as many of these electrolytes as possible rather than a single electrolyte only form of BHB. This way, you get two keto supplements in one. These ketones taste really bad on their own, so they are mixed with sweetening agents to make them more appealing. I recommend monk fruit and/or stevia as the sweetening agents. 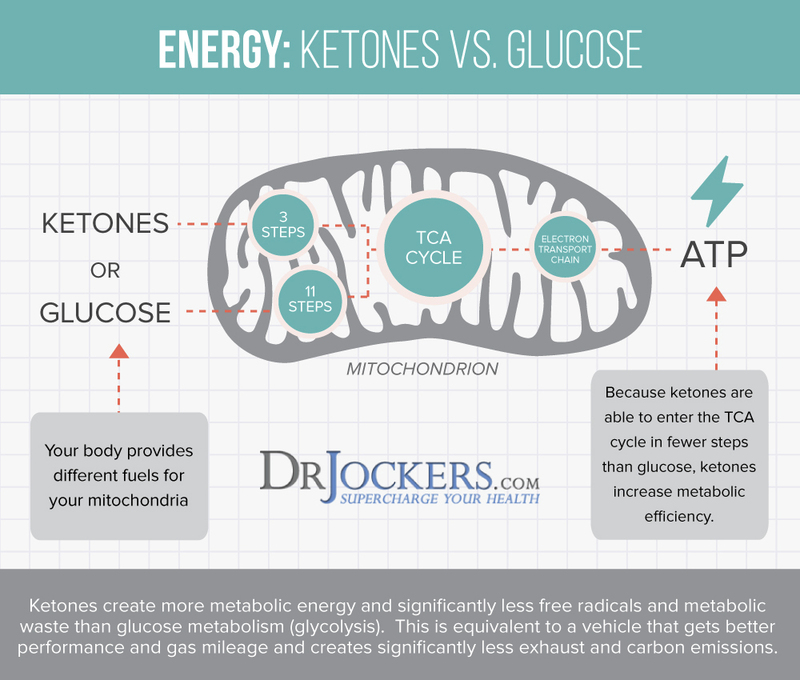 According to my friend and top keto researcher Dr. Dominic D’Agostino, exogenous ketones are best utilized in combination with MCT fats in order to maximize the amount of time the ketones stay elevated in the bloodstream. Taking exogenous ketones without MCT fats causes a spike of ketones within 10 mins but the ketone elevation dies within 45-60 minutes after ingestion. When combined with MCT fats it can last up to 3 hours after ingestion. Now if you get a combination of exogenous ketone salts mixed with MCT oil, you get three keto supplements in one package (ketones, electrolytes, MCTs). Timing on exogenous ketone usage can be key to get the best benefits. As an example, if you are looking to get keto-adapted and want to reduce the unwanted side effects that come in the beginning, you can use exogenous ketones in the morning when you would normally have breakfast to extend your fasting window another 1-3 hours or so. If you have trouble going 4-5 hours between meals because you get hypoglycemic, then you may want to use the exogenous ketones about 3-4 hours or so after your last meal to help the body deal with the lower blood sugar levels more effectively. Anxiety Take at the onset of anxiety symptoms or 10-30 mins before an activity that would normally cause anxiety. Mental Decline Replace a meal or extend fasting window by taking exogenous ketones when you feel tired or mentally fatigued. Headaches/Migraines Take immediately if you feel early stages of headache onset and or before any sort of time period or activity that may provoke a headache. Recovery from Stress Take 10-30 mins before a stressful activity and/or immediately after a stressful activity. To Prevent Jet Lag While Traveling Take 10 mins or so before you want more energy and better mental clarity while traveling. They will also help reduce the impact of jet lag on your mental recovery. As the keto movement picks up, there is no shortage of keto supplements flooding the market to take advantage. There are some erroneous statements that people are making about exogenous ketones. This includes statements that are both extremely positive and negative on their usage. These polarizing statements would make you think they are a panacea or an overpriced, overmarketed tool that only a very small percentage of the population can benefit from. Both of these polar opposite opinions of their usage are half-truths and do not give an accurate understanding of how these ketones impact our body’s physiology. One of these is that they will block your body’s ability to burn fat and produce its own ketones endogenously. 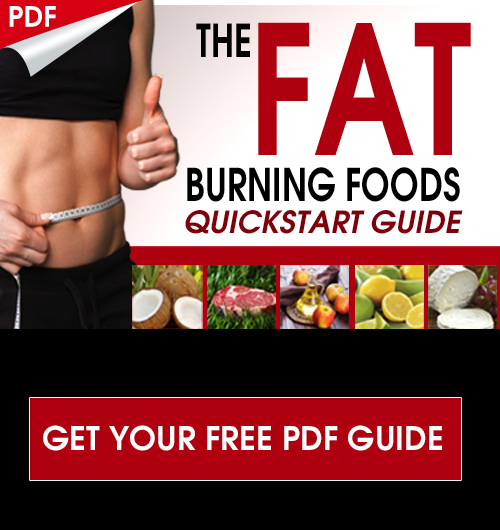 This is only true in the short-term, but the adaptation the body can make from using exogenous ketones along with nutrition and lifestyle strategies will help the body become a more efficient fat burner. Exogenous ketones are a fuel source…so consuming them will provide a fuel for the body and temporarily inhibit the breakdown of body fat. However, this is very short term, and the use of exogenous ketones helps the body become more familiar with how to produce and utilize endogenous ketones from our own body fat. This is if you are using them alongside a ketogenic diet and some form of fasting practice. If you are eating a carb-heavy diet and using ketones on top, you will get some benefits from having circulating ketones in the body, but you will not support your body’s ability to make its own. Below are some additional strategies to boost ketones in the body. The other major myth is that you can eat whatever you want, take exogenous ketones and get all the benefits that come with ketosis. This is again a half-truth in that you can consume a high carbohydrate diet, take exogenous ketones and you will have elevated blood ketone levels. If you take enough of the ketones, your ketone levels will be in the 0.5-3.0 mmol range to qualify as being in nutritional ketosis. However, your body will not be creating these ketones and you will still have high blood sugar and insulin levels so you will not be getting the full benefits of ketosis. As a caveat, if you are consuming a high carb diet, there is still benefit to having ketones in your bloodstream as it may reduce the amount of insulin your body produces and reduce the amount of inflammation and oxidative stress that occurs with poor diet. But it is not to say that you would get anywhere near the same benefits you would get from a well-formulated ketogenic diet and lifestyle. Electrolytes are substances that can be used to conduct electricity when dissolved in water. All of us need electrolytes to survive as they play a role in every metabolic process within the body. The level of a specific electrolyte in the blood can become too high or too low, which leads to an imbalance. 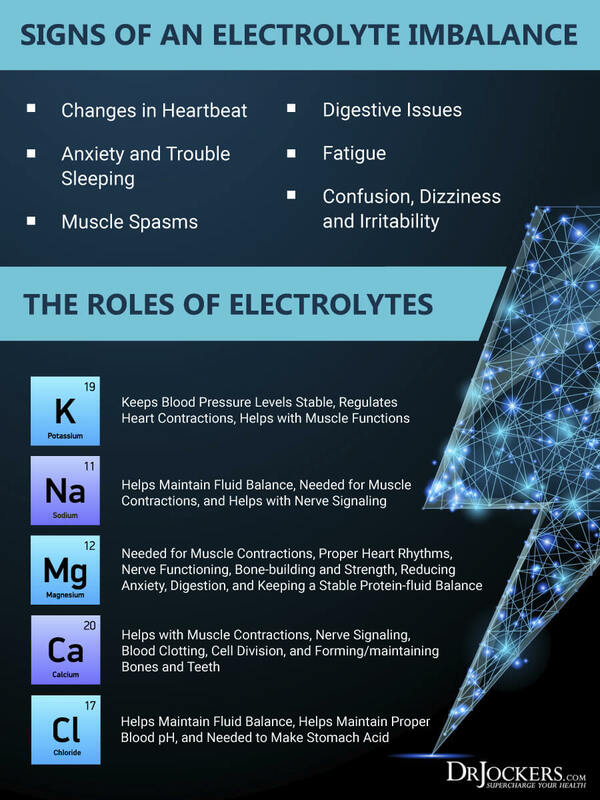 Electrolyte levels can change in relation to the fluid volume of the body. Dehydration or overhydration can be factors as can significant dietary changes such as a very low carbohydrate diet. Electrolytes are lost from the body when we sweat, bleed or after bouts of diarrhea or vomiting. The kidneys and several hormones regulate the concentration of each electrolyte. If the substance gets too high in the blood, the kidneys filter it from the body and various hormones work to create balance. One of the key hormones that act on the kidneys to retain certain electrolytes is insulin. The main activity of insulin on electrolyte balance is to increase sodium retention. Because sodium pulls water it means that when insulin is higher, we retain more water. As you transition into a ketogenic diet, your insulin levels will naturally fall and therefore your body will excrete more sodium and fluid. Other electrolytes will be excreted as well although not to the degree that we lose sodium. 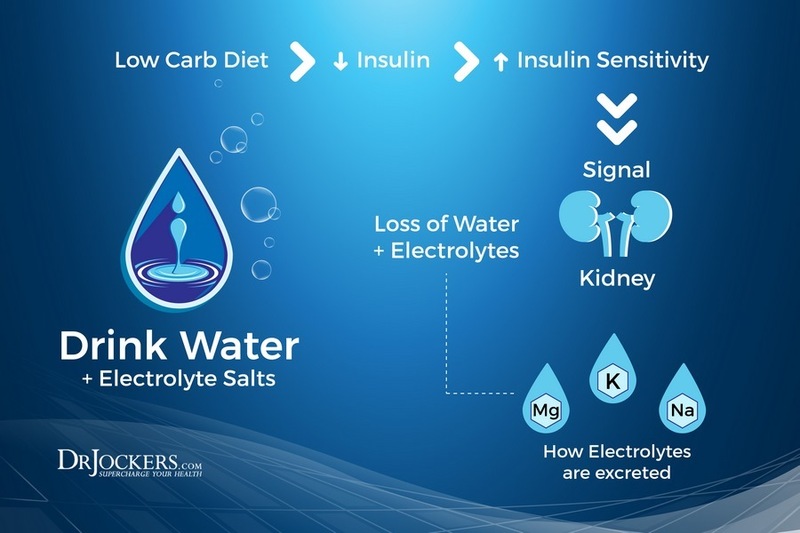 This is the reason it is so important to consume more electrolytes and especially sodium on a ketogenic diet. You can easily do this by salting your foods well and consuming foods naturally rich in sodium and other electrolytes. 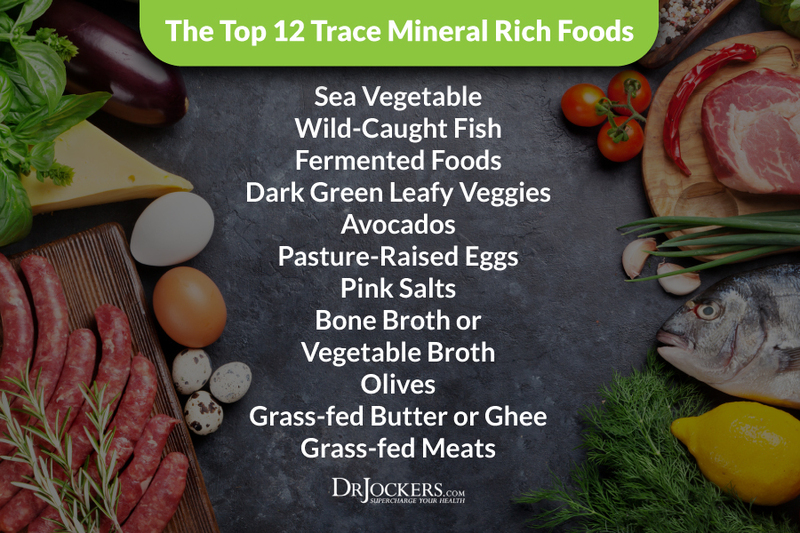 Check the graphic below for some of the best food sources of trace minerals and electrolytes. Don’t be afraid to use generous amounts of a natural sea salt on your foods. In some cases, supplemental electrolytes can be excellent keto supplements. This is especially the case if you are doing a lot of exercises or competing in an athletic event in the heat of the summer as you will be sweating out the electrolytes. A good electrolyte powder should have 75-200 mg of potassium, sodium, calcium, and magnesium per serving. If you take too many electrolytes, you may notice they have a laxative effect. Be sure your electrolyte powder does not have any added sugar or artificial sweeteners such as aspartame or sucralose. The flavoring should be made from stevia or monk fruit or possibly non-GMO erythritol. There are a unique array of compounds used in natural medicine called adaptogenic herbs that help the body to better adapt to stress. Adaptogenic herbs don’t affect an individual’s mood but they help the body function at its optimal level during times of stress. They do this by modulating the production of stress hormones like cortisol and adrenaline (7, 8). Adaptogens can be great keto supplements because cortisol can tend to become a little higher during the initial adaptation phases of a ketogenic diet. Adaptogens are also great keto supplements for those who are dealing with adrenal or thyroid issues. Adaptogenic herbs include Panex ginseng, ashwagandha, Rhodiola, cordyceps, astragalus, holy basil, Siberian ginseng (Eleuthero root) and maca as well as others. Start with small doses of these and gradually go up. These herbs are best used in the morning and mid-afternoon for most individuals. Many people notice an increase in energy and mental clarity from them and if you take them at night they could possibly keep you up. 3 notable exceptions are reishi mushroom, lemon balm, and ashwagandha which tend to be more relaxing and help people sleep better. Some individuals find they respond better to certain adaptogens better than others so be sure to monitor how you feel and your level of stable ketosis. If you notice that they induce cravings or make you feel fatigued, you are probably having a stress response to the herb itself. This isn’t a complete list at all but it is a start. Here is how I recommend using them. Lemon Balm: This is also called Magnolia Officinalis, begin with 100-250 mg, 1-2x daily and you can gradually go up to 500 mg – 2x daily. Reishi Mushroom: Begin with 250-500 mg, 1-2x daily and you can gradually go up to 500-1000 mg – 1-2x daily. It is always wise to start slow and low and gradually work your way up if you feel good with the lower dosage. You can also stay at the lower dosage…as these adaptogens will provide plenty of benefits over time, even with lower dosages. For individuals that tend to have a greater degree of sensitivities, I recommend staying at lower dosages and possibly rotating adaptogens until you find a few that you respond really well too. Adaptogen rotation could be something like taking 1-5 of these each day for 7-10 days and then rotate to use a different 1-5 adaptogens. The rotation isn’t necessary but some individuals feel like they get better benefits using them like this. I have found that many people struggle with digestive issues as they transition into a keto lifestyle. The increase in healthy fats causes a greater need for the liver and gallbladder to produce and secrete bile and the pancreas must produce larger amounts of the fat-digesting enzyme, lipase. The key supplements to support your digestive system include digestive enzymes, probiotics, betaine HCL, bile salts, and Ox Bile. As keto supplements, these can be helpful for helping the digestive system adapt in the initial stages, but can also serve as an excellent way to reduce stress on the digestive system overall. Next, I am going to elaborate on different digestive support options. I think everyone would greatly benefit from taking digestive enzymes. Enzymes help to facilitate the digestive process and take stress off our body’s digestive system. A common myth is that if we use digestive enzymes, it will inhibit our bodies ability to produce its own digestive enzymes. This isn’t true. Stress is the primary antagonist to proper digestion. Poor digestion over time can lead to the atrophy of the villi in the intestinal wall which are what produce the majority of digestive enzymes. Supplemental digestive enzymes help rebuild and prevent this from happening. Digestive enzymes work to break down food compounds, making them less irritating to our gut and less stressful on our body. This actually enhances our body’s ability to produce all of its digestive juices and reduces overall gut inflammation while improving nutrient absorption. One of the main signs of poor digestive enzyme production is gas and bloating, in particular, after consuming vegetables. 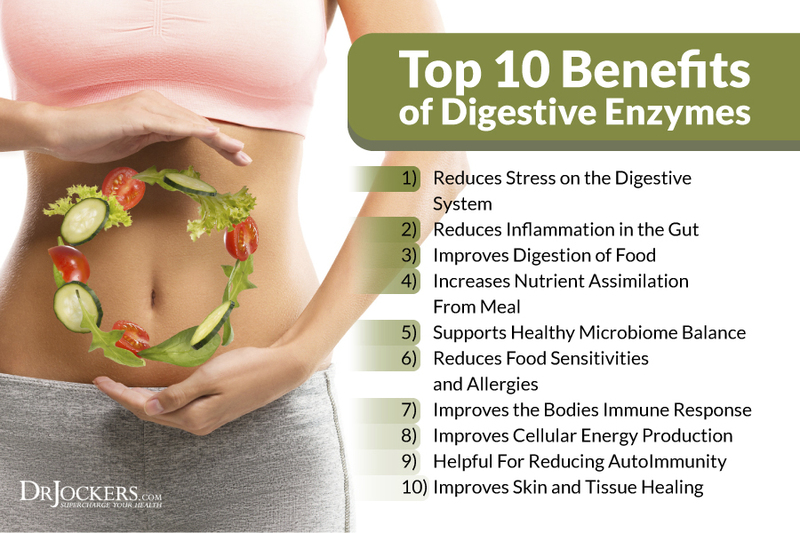 Other signs are much subtler but I would say if you have any chronic health condition, you are most likely benefit from digestive enzyme supplementation. 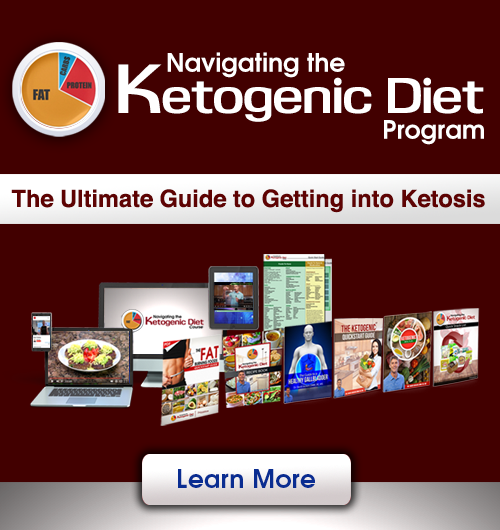 The key enzymes for individuals on a keto diet are going to be the fat-digesting enzyme lipase and the protein-digesting enzymes protease and peptidase. Be sure to get an enzyme that has a strong amount of these key enzymes. There are recently developed enzymatic blends that are formulated for those on a ketogenic diet. Keto Digest is an excellent one I use and recommend. I have discussed stomach acid in many articles and how important it is for optimal digestion. At rest, our stomach is typically between 3.0-3.5 on the pH scale. For reference, water is a neutral 7.0 on the pH scale. In order to digest thick pieces of protein effectively, we need to get our stomach acid levels to a pH of 1.8-2.2. This is quite a big jump and depends upon a high level of stomach acid production. If we try to digest a steak and feel tired, have heartburn or gas and bloating afterward…this is a sign there is not enough stomach acid present. Other signs include chronic bad breath, iron, zinc or B12 deficiencies, weak fingernails and lots of food sensitivities. You can also do the baking soda-stomach acid test below. If you find you have symptoms of low stomach acid, this is going to be one of your most important keto supplements. I am especially fond of trying 1-2 tbsps of apple cider vinegar in 2-4 oz of water about 15 mins before your meal. If you don’t notice a significant improvement with this, then look to add in a Betaine HCL supplement. This is a very reliable test you can perform if you have the symptoms above and failed the Baking soda test. It will cost you a bottle of Betaine HCL ($20), which you will probably need anyways if to help you restore HCL levels if they truly are low. Finish the meal and observe what you notice. Nothing Happens: If you do not notice any difference it is most likely that you have low stomach acid levels. Usual Indigestion and Heartburn: If you normally have indigestion and you have the same experience, it typically means you have low stomach acid and actually did not take in enough Betaine HCL to get your acid levels low enough to close the esophageal sphincter. You may want to try using a higher dosage until you notice a difference. Unusual Indigestion and Heartburn: If you notice a burning, hotness or heaviness in your chest, then these are signs you have adequate stomach acid levels. It is also possible that you may have a hiatal hernia, but in either case, I would recommend digestive enzymes over stomach acid support if you notice this. Burning at the Pit of Your Stomach: This is lower than the chest region and signifies that you have a weak stomach lining and possibly an ulcer. In this case, you definitely would not want to use Betaine HCL until you have healed the ulcer. Better to focus on digestive enzymes in this case. Took the Capsule Before the Meal: This will almost always cause indigestion as your body isn’t ready for the supplement. Have Esophageal Sphincter Dysfunction: For some individuals, they may have a hiatal hernia or poor contractile activity of the esophageal sphincter that can cause an increase in indigestion like symptoms. It is always good to get a medical exam to rule these things out before doing the test if possible. One of the most important supplements I have ever worked with is supplemental hydrochloric acid. I have seen this make a huge difference in so many people’s lives. This is a simple betaine HCL tablet. You should find them in dosage ranges of 300-500mg per capsule and in combination with 100-200 mg of Pepsin per capsule. There are 2 protocols I use with my clients. One is for those who have acid reflux on a regular basis while the other is for those who rarely (once a month or less) or never experience acid reflux. Always take the Betaine HCL either half-way through the meal or right at the end of the meal. Never take it before the meal or you may get a faulty experience of heartburn and you will turn off your natural stomach acid production for this meal. Additionally, if you are taking any sort of NSAID medication such as ibuprofen, Tylenol or aspirin do not take HCL. Take 1 capsule during or after the meal (never before the meal) and see if you notice a mild burning sensation in your stomach, chest area. This is a mild experience of indigestion or heartburn. When you notice this with 1 cap of HCL, it is a sign you are producing enough HCL. If not, you are not producing enough HCL. At your next meal, try taking 2 caps and continue this until you find how much it takes to induce indigestion/heartburn. If 4 caps induce indigestion, then take 3 caps with your larger protein meals (not protein shakes or broth – only meals with meat and protein). Once you begin feeling indigestion with 3 caps, drop it to 2, etc. Take 1 capsule during or directly after the meal (never before the meal) and see if you do not have indigestion. If you continue to have indigestion, you need more. At your next meal, take 2 caps and continue this process until you find the amount you need in order to not have indigestion. Continue to use this amount until you notice you have indigestion again. When you do, drop your dosage by 1 cap for your next meal. If 4 caps took away your indigestion you can stay on that until you noticed that 4 caps now CAUSED indigestion. Then you can drop your dosage to 3 caps until you notice the new amount causes indigestion. When you notice indigestion at 3 caps, drop it to 2 and continue with this until you plateau or are able to completely eliminate the usage of the HCL caps. This is a common question I get from clients after they see the remarkable results they get from HCL. Because stomach acid is something our body naturally should produce, this is a very valid question and concern. The answer is maybe. Individuals who are younger and healthier can absolutely regain near optimal HCL production. Older individuals or those with chronic health problems may need extra stomach acid support for life. Either way, your life will be much better by taking the HCL supplements you need to optimize your digestion. Fortunately, they are one of the most inexpensive supplements you can find on the market. If you are dealing with a sluggish thyroid, then it can sometimes be more difficult to burn fat. It may be necessary to test for and improve thyroid function to optimize your keto lifestyle. For general thyroid health advice, check out this article. The most important nutrients for thyroid function include iodine, selenium, iron, B12, zinc, vitamin A, vitamin D, amino acids and magnesium. In some cases, absorption can be inhibited due to low stomach acid, poor digestion, or certain autoimmune conditions. In addition to eating a wide array of nutrient-dense foods, it is helpful to optimize your digestion. You can supplement with a great professional grade multi-vitamin. Getting tested to see what your levels of these key nutrients are can be helpful as well. You may find that one of the compounds listed below are one of the most effective keto supplements you incorporate into your life. When I have clients with poor thyroid function, I often use adaptogenic herbs such as ashwagandha and lemon balm to help balance stress hormones and improve thyroid hormone expression. In addition, I have found that using a non-prescription cow based (bovine) glandular along with herbs and supportive nutrients has been a game changer for many of my clients. The bovine glandular contains thyroid hormone elements and valuable nutrients to support thyroid hormone production and utilization. This supplement is typically low cost and over the counter. We sell one called Thyroid Strong on my online store. I usually start my clients on 2 caps in the AM upon rising. They can then work up to 4-8 caps in the AM upon rising if they don’t notice any changes. Oftentimes, people will begin a ketogenic lifestyle in order to combat thyroid disorders based in autoimmunity. In this case, glandular extracts and herbs will be important keto supplements for you. If hyperthyroid symptoms arise such as feeling hot, irritable or anxious, we will lower the dosage or discontinue the supplement. If you believe that thyroid issues are an ongoing challenge for you, then it can be really helpful to have a Complete Thyroid Panel done. This panel has the added benefit of showing electrolyte levels, cholesterol, inflammation markers, blood sugar, and thyroid hormone function all in one data package. In many cases, a thyroid medication may be warranted. As a functional clinician, if my Thyroid Strong glandular isn’t helping at a high dosage, then medication may help. Additionally, if someone is already taking a thyroid medication and feel like they are getting good results with it…then I would not recommend they stop. Instead, they should have a conversation with their prescribing physician to make sure their dosage is optimal. This would be done alongside lifestyle changes. With thyroid medication, some people do very well on standard T4 medications such as Synthroid and Levothyroxine. Others will do better on a T3-only prescription such as Cytomel. Another option that people do well with is a natural, desiccated thyroid hormone such as Armor Thyroid or Naturthyroid. Anyone of these can be a good option for you. Work with your physician and experiment until you find the right medication and dosage that works best for you. Finding the right medication and dosage should result in desirable weight changes, stable cognitive function, and good energy levels generally speaking. Meanwhile, focus on improving your lifestyle, addressing blood sugar, digestive, and chronic inflammatory issues. This will continue to improve your health. The mitochondria within every cell of the body are where ketones are burned and cellular energy is produced. This is done through a few complex biochemical processes that require specific nutrients. In some cases, due to poor lifestyle, genetics and chronic stress, we can end up with a deficiency in key nutrients needed to run the mitochondria. If you are trying keto to boost your energy levels, mitochondrial support nutrients may be a top consideration for your keto supplements. These nutrients include things like Coenzyme Q10, Acetyl-L-Carnitine, B vitamins and magnesium. In addition, glutathione plays a big role in protecting the mitochondria. Ensuring your glutathione levels are topped off can be done with precursors such as N-Acetyl Cysteine (NAC). For certain individuals, they have trouble producing enough glutathione from precursors alone and need supplements such as S-Acetyl Glutathione and/or liposomal glutathione forms to support overall glutathione levels. These forms bypass the digestive tract, where glutathione is broken down, and pass into the bloodstream and into the cells of the body. Additionally, if you have been on certain medications for lowering cholesterol (statins), blood pressure, blood thinning agents, anti-depressants, and some diabetic medications – then you are at a higher risk of mitochondrial dysfunction and will benefit from additional mitochondrial support nutrients in your keto supplements regimen. Here are some good starting places for dosages. You can also do lab testing to determine the proper dosage for you. My team runs both Organic acid tests as well as a Micronutrient test to look at some of these important nutrients. CoQ10: This is a powerful intracellular and intramitochondrial anti-oxidant that is necessary for the production of cellular energy. You will find supplements in the form of ubiquinone, ubiquinol or pyrroloquinoline quinone (PQQ). These are fat soluble, so I always recommend taking them with meals at 50-100 mg daily. You can then move up to 200-500 mg daily. Some cases up to 1000mg is warranted, or until you hit the sweet spot and have more energy. Acetyl-L Carnitine: This helps muscle cells drive energy efficiently from fat metabolism. Up to 70% of the energy produced by muscle cells (including the heart) come from burning fats. Carnitine is the gate-keeper that allows fatty acids to pass into the mitochondrial furnace effectively. If you don’t have adequate carnitine then you will be unable to produce ketones from long-chain fats adequately. You will either have to use a lot of MCT or SCT oil or be unable to be in ketosis. You should find the Acetyl-L form of Carnitine which is the most bioavailable form. Starting dosages can be 200-400 mg and up to 2-3 grams per day if you have a significant deficiency. B Vitamins: Underestimated as keto supplements, B Vitamins play a vital role in the production of cellular energy, neurotransmitters, methylation, liver function, cellular reproduction and so much more. Look for activated forms of B Vitamins such as the following list. These forms have greater bioavailability in the body. Look for a multi-vitamin with these active dosages or take a B complex that uses these active nutrient forms. We have the High Energy Support and also our B Strong that have proper dosages of these B Vitamins. This is the bodies master anti-oxidant that has a profound impact on reducing inflammation in the body. Glutathione is a key component to phase II liver detoxification and it protects the intracellular DNA and mitochondria from damage. Pure glutathione gets broken down by the digestive system but you can boost your glutathione levels with supplements such as the precursor N-Acetyl Cysteine (NAC). You can also get it in forms that bypass the gut such as S-Acetyl Glutathione and Liposomal Glutathione. All of these forms are very beneficial but many believe the S-Acetyl and the Liposomal to be the most bioavailable. Supplemental ranges of these forms are going to be 100mg to 1000-1200 mg on the very high end. As you can see there are many supplements that can benefit one on their ketogenic journey. The list I went through in this article is just skimming the surface. There can truly be an entire book on keto supplements to support the ketogenic lifestyle. This article was intended as a list of some of the most commonly deficient or most immediately beneficial keto supplements.